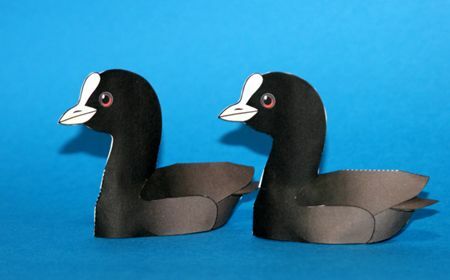 These animal paper models are two Common Coots, designed by zardoz. Coots are medium-sized, crane-like birds that are members of the Rallidae family. They constitute the genus Fulica. Coots have predominantly black plumage, and – unlike many rails – they are usually easy to see, often swimming in open water. They are close relatives of the moorhen.